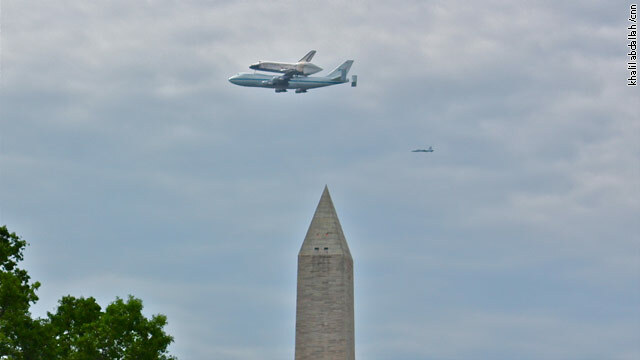 The space shuttle Discovery made three passes by the White House and the National Mall on its farewell flight to the Smithsonian's Air and Space Udvar-Hazy Center near Dulles Airport. Members of the White House Press Corps gathered on the north side of the White House to see the shuttle over the West Wing. No word yet on whether President Obama caught a glimpse of the shuttle. NASA's shuttle program ended under the Obama administration after funding was cut by $1.5 billion dollars. Obama has said the closing of the program "propels us into the next era of our never-ending adventure to push the very frontiers of exploration and discovery in space." Why should they say goodbye to that one in the White House because he is the person who stopped supporting the space venture and made so many people get unemployed. Obama should be the one saying goodbye to the WH because very soon he will have to start packing his bags. Going back home to Chicago!!!!!!! GW Bush decided to end the Shuttle program in 2004.that initially shut down the shuttle and did not supply additional funding for a replacement. The current gap in the ability for the US to provide manned launches was part of the original plan. The Russians can give us a ride to the ISS for the next 10 years... Who needs to spend 7 Billion a year on welfare for Aero Engineers? it is time to turn nasa over to private companies who can do a better job on the space program. The Shuttle Program was axed long before President Obama took the oath of office. Of course, it's ALWAYS easy to blame the man in charge who just so happens to be from a different political party than you. And the last time I checked, the space shuttle was a self-described pickup truck, only delivering parts and things to the ISS. Last I checked, the shuttle has never left Earth orbit. While it is sad that the program is ending, it's time for us to move on with a new spacecraft...when we can actually AFFORD it. In the meantime, I see NO problem with letting the Russians take us up. This is called "Cooperation", boys and girls. Grown-ups do it all the time. "That one" in the White House is President Barack Obama." The funding was being stopped under GWB. Funding cuts for NASA and the Military are Obama's only idea for debt reduction. Curb your kool-aid intake and take a sip of reality instead. It was actually Bush that cut the Shuttle program – – and Obama actually has spent more on Defense than Bush, and GOT the one that planned 9-11,and it was Bush that told the country he wasn’t interested in pursuing Bin Laden.. Joe. If I were to have a space shuttle, it would look just like that. No picture could sum up washington better. A still functioning, hard-working, American made 747 has to carry a worthless piece of junk on its back. And on tax day no less! TEA PARTY REPUBLICANS, NEWT WILL GLADLY SHIP YOU ALL TO THE MOON FOR $50. Get it straight, my friend. Newt is interested in Mars and not the moon! NAH, HE WANTED TO START A MOON COLONY FIRST THEN MARS. IN THE OFF CHANCE THEY ACTUALLY MAKE IT TO THE MOON, I WOULD BET THEY KILL EACH OTHER OFF BEFORE THEY EVEN THINK ABOUT MARS. I GUESS YOU MISSED ALL THE SNL SKITS, TRY TO KEEP UP. Looks like I'll have to adjust the DVR! But enough of this civility. Back to the political hatefest! Whatcha got? Actually, President Bush made the choice to eliminate the shuttle program back in 2004, one year after the Columbia disaster. There are plans to return to the moon between 2015 and 2020 with newer technology. Space research has not ended it is just retooling. The Orion crew capsule will put us further into space than the shuttle. IT'S TIME FOR THE PRIVATE SECTOR TO PITCH IN FOR THE MORE AMBITIOUS PROJECTS LIKE THE MOON OR MARS. OF COURSE, THAT'S THE AMERICAN WAY BUT REPUBLITARDS WOULD RATHER BLAME OBAMA. I have read a few good stuff here. Certainly value bookmarking for revisiting. I wonder how so much effort you place to create one of these wonderful informative site.